Question #48: Where are Christ’s two genealogies? Why do not the other Gospel writers have a genealogy? Luke the historian writes the legal line of Christ’s genealogy. 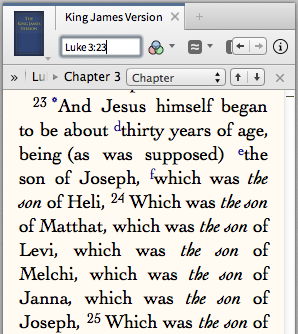 Answer: Christ’s two genealogies are found in Mt 1:1-17 (the Regal line) and Lk 3:23-38 (the Legal line). There is no genealogy of Christ found in the Gospel of Mark because Mark presents Him as the Servant. (And servants don’t need no genealogies!) There is neither a genealogy of Christ found in the Gospel of John because John presents Him as God.